This fact sheet provides information on hydrocephalus and shunts. This fact sheet provides information on hydrocephalus and shunts. Our fact sheets are designed as general introductions to each subject and are intended to be concise. Each person is affected differently and you should speak with your doctor or specialist for individual advice. Please note that this fact sheet provides information on hydrocephalus in adults. It does not include information on hydrocephalus in children or congenital hydrocephalus (hydrocephalus present from birth). Hydrocephalus is a build-up of fluid in the brain. The excess fluid leads to increased pressure on the brain which can cause damage to the brain tissue. 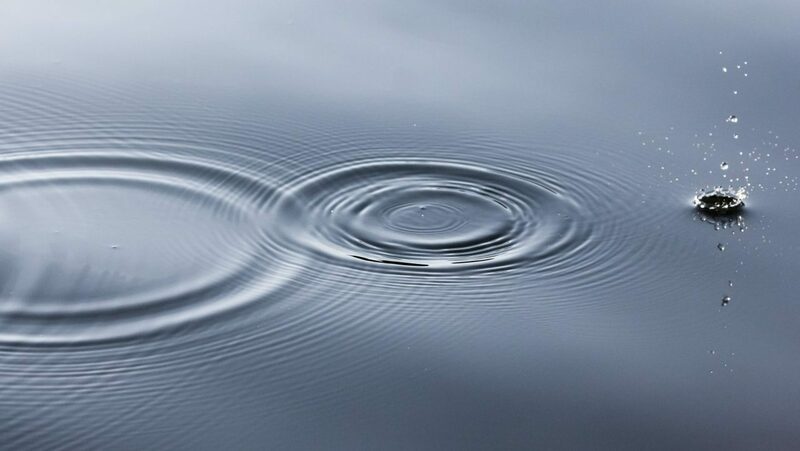 In the past, hydrocephalus was sometimes referred to as ‘water on the brain’ (the word hydrocephalus comes from the Greek words for water and head). However, the excess fluid is cerebrospinal fluid (CSF), not water. There are two main forms of hydrocephalus in adults: acquired hydrocephalus and normal pressure hydrocephalus (NPH). People with NPH experience a build-up of CSF in their brains without necessarily experiencing a significant increase in pressure. Cerebrospinal fluid (CSF) is a clear, colourless fluid that surrounds the brain and spine. It contains glucose and is slightly thicker than water. We produce almost a pint (500ml) a day in the ventricles (cavities) of our brains. It flows around the brain and spine, through the space between the brain’s membranes, and is then absorbed into the bloodstream. The main functions of CSF are to protect the brain (it acts as a shock absorber), to carry nutrients to the brain and remove waste from it. People would not necessarily experience all of these symptoms, but they would usually experience more than one of them. In cases of normal pressure hydrocephalus (NPH), the build-up of CSF can be gradual and the symptoms of hydrocephalus might develop slowly over long periods of time (months and years rather than weeks). Acquired hydrocephalus is caused by damage to the brain after a head injury or after conditions such as stroke, brain haemorrhage (a bleed in the brain), brain tumour, or meningitis (an infection in the membranes of the brain). The damage results in enlarged ventricles which fill with excess CSF, or causes blockages at points where the CSF is absorbed into the bloodstream. The cause of normal pressure hydrocephalus (NPH) is usually unknown. It might be that the build-up of CSF is related to problems in the ventricles of the brain or an underlying health condition affecting the blood flow through the brain (for example, heart disease or high cholesterol). NPH usually affects people aged 50 years or older. The symptoms are similar to other conditions such as Alzheimer’s disease and, as a result, NPH might not always be diagnosed correctly. The key test for hydrocephalus is a brain scan. This might be a CT (computerised tomography) scan or an MRI (magnetic resonance imaging) scan. The scan results can show signs of a build-up of CSF and increased pressure in the brain. A brain scan is usually the first test for someone suspected of having hydrocephalus because it can rule out other possible causes of the symptoms, such as stroke or brain tumour. You will also have a physical examination by a neurologist to check your symptoms as part of the assessment. You might also have an eye test to check your vision and to look for any swelling behind your eyes caused by pressure in the brain. A lumbar puncture is a procedure commonly carried out to investigate hydrocephalus and assess what treatment might be suitable. It is the simplest way to extract a sample of CSF and check pressure levels. During a lumbar puncture, a needle is passed between two vertebrae (spinal bones) at the lower end of the spine (the lumbar area) into the space containing the CSF. A small amount is drawn off in a syringe and the pressure is checked. After the procedure, you will be tested to see if your symptoms have improved with the removal of the CSF. The key treatment for hydrocephalus is a shunt. 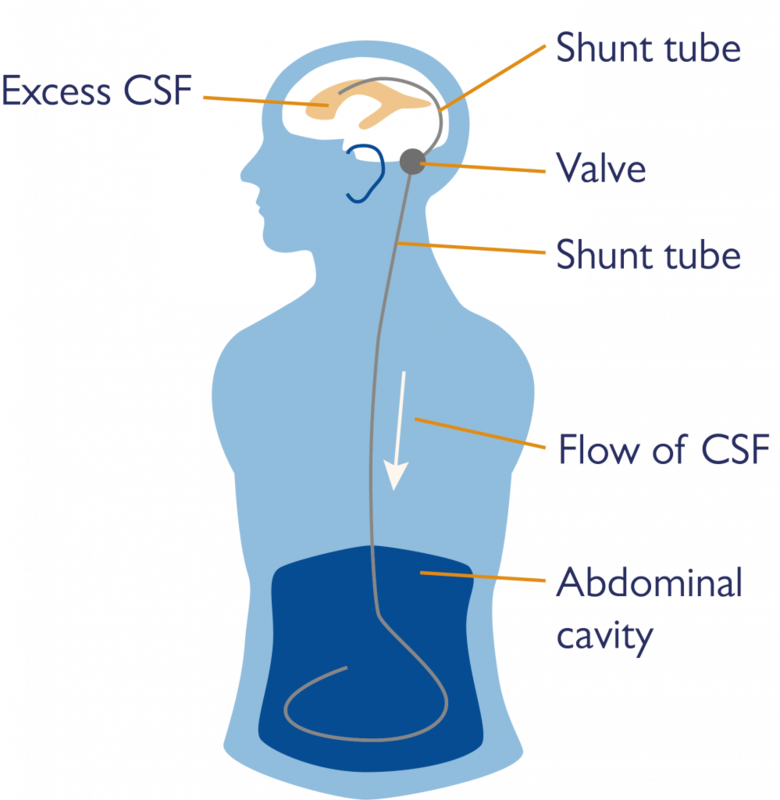 A shunt is a thin tube implanted in the brain to drain away the excess CSF to another part of the body (often the abdominal cavity, the space around the bowel) where it can be absorbed into the bloodstream. The CSF is controlled by a valve. A burr hole about the size of a penny coin is made behind the ear and a small plastic disc is inserted under the skin. The CSF is pumped through the tube in the brain into the disc then through another tube into the abdominal cavity. The pressure of the valve pumping the CSF is set externally by computer. It might take a couple of months for the shunt system to settle and function as desired and for your symptoms to subside. There are various possible shunt complications. These include mechanical failure, malfunction and blockages, resulting in a return of symptoms. Infections are also possible. You should seek medical attention immediately if you have any reason to suspect that your shunt is not functioning properly. The shunt will not be removed even if you do not experience any more symptoms and follow-up scans show no further signs of increased pressure in the brain. A small number of adults with hydrocephalus are treated with a procedure called a third ventriculostomy where a tiny hole is made below the third ventricle in the brain to allow the CSF to bypass a blockage. Your neurosurgeon will assess your possible suitability for this treatment and discuss this with you. The prognosis for hydrocephalus depends on the individual and is affected by factors such as age, general health, the specific cause of the hydrocephalus, how far the condition has progressed and the extent of the damage to the brain caused by the increased pressure. Left untreated, hydrocephalus can be fatal as increased pressure in the brain can eventually compress the brainstem which is responsible for regulating our heartbeat and breathing. Shunts are usually a successful treatment. It is possible for adults with hydrocephalus to make a full recovery when treated with a shunt. Support and information on spina bifida and hydrocephalus for people in England, Wales and Northern Ireland. Support and information on spina bifida and hydrocephalus for people in Scotland. This information was last checked in December 2015. Due for review in November 2018. The Brain & Spine Foundation Helpline offers information and support for people affected by neurological problems. Call 0808 808 1000 to talk to the team.